This post was first published in November 2014. However, with resurgent interest in affirmative action and the Asian American & Pacific Islander (AAPI) community, I have republished this post updated for 2017. In 2014, two lawsuits were filed by conservative anti-affirmative action activist Edward Blum hoping to challenge affirmative action policies by framing the debate around purported anti-Asian bias in selective universities’ admissions policies. In 2017, a memo leaked by the Department of Justice suggests that a major priority of the Trump administration will be to target colleges who use race-conscious affirmative action in their admissions policies, with conservative supporters specifically citing affirmative action’s allegedly negative effects on Asian American applicants. Thus, the AAPI community finds ourselves once again thrust into the spotlight in the national affirmative action debate. Opponents of affirmative action suggest that these latest legal efforts are on behalf of the AAPI community. They suggest that most AAPIs are against race-conscious affirmative action, yet several studies reveal that more than 65% of Asian Americans and Pacific Islanders support affirmative action, both in professional and academic settings. It’s important that we accurately represent the political opinions of Asian Americans and Pacific Islanders on this issue. Specifically, we must render our community’s support for affirmative action visible. In 2014, I aggregated a list of AAPI groups and writing in support of affirmative action. I have replicated and modified that list in this post, and will update it over the next several months with additional writing from around the internet. 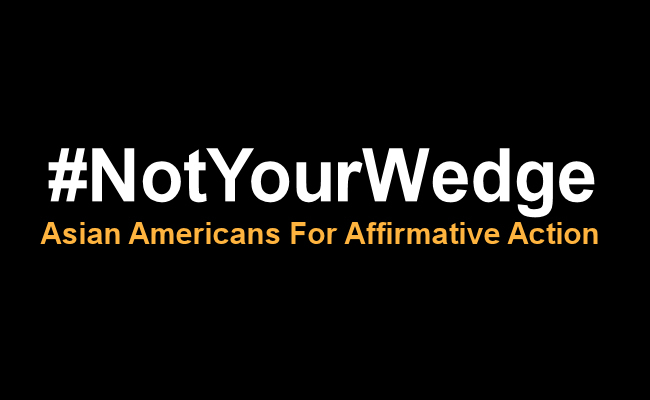 Please feel free to link to this post as a resource regarding the attitudes of AAPI on affirmative action in the upcoming national debate on this issue. The abundance of this writing demonstrate clearly that while affirmative action is a polarizing topic within the AAPI community, there is strong and vocal support for race-conscious affirmative action in our community that deserves visibility.